In 1889, TANAKA succeeded in commercially manufacturing Japan’s first platinum filament for light bulbs. Some time later, it started manufacturing such things as electric contact points for telecommunications and crossbar contacts for telephone switchboards. In recent years, it has held the greatest share globally of ultrafine gold wire for bonding, an essential part of semiconductor and other manufacturing processes. And currently, it is busy developing and marketing precious metal materials for vehicle sensors, vehicle exhaust emission control catalysts, fuel cell catalysts and crucibles used to manufacture sapphire substrates for LEDs, etc. 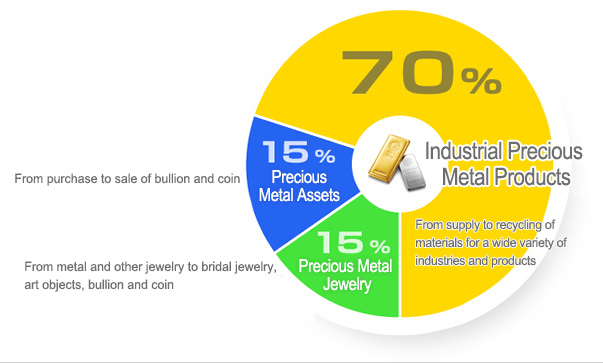 Seventy percent of TANAKA’s activity is in the field of industrial precious metal products. TANAKA’s products are in use in many products we used in our everyday lives, including all sorts of consumer electronics items, information technology devices, and automobiles. The TANAKA Kikinzoku Group is actively involved with eight precious metal elements; platinum (Pt), gold (Au), silver (Ag), palladium (Pd), rhodium (Rh), iridium (Ir), ruthenium (Ru) and osmium (Os). The Group is mostly involved in the manufacture and sale of industrial products using these precious metals, while within Japan it is also involved in business-to-consumer (B2C) commercialization of precious metal assets and precious metal jewelry. An important characteristic of the TANAKA Kikinzoku Group is its diverse and varied dealings with precious metals, which realizes the organic connections and mutual synergies between business-to-consumer (B2C) and business-to-business (B2B) activities. The TANAKA Kikinzoku Group is centered around TANAKA Holdings. It is a global group with manufacturing and sales facilities established from early on in Europe, the U.S., China and Asia, building systems that meet the expectations and trust of customers.